Republicans apparently have learned all the wrong lessons from 2016. Hillary Clinton spent most of her time and money demonizing Donald Trump and moaning about possible conservative Supreme Court appointments instead of convincing voters that she would make their lives better. It didn’t work. Of course, part of the problem was the messenger, but I believe a major factor was a seriously off-target message. So here’s the plan, as far as I can see. 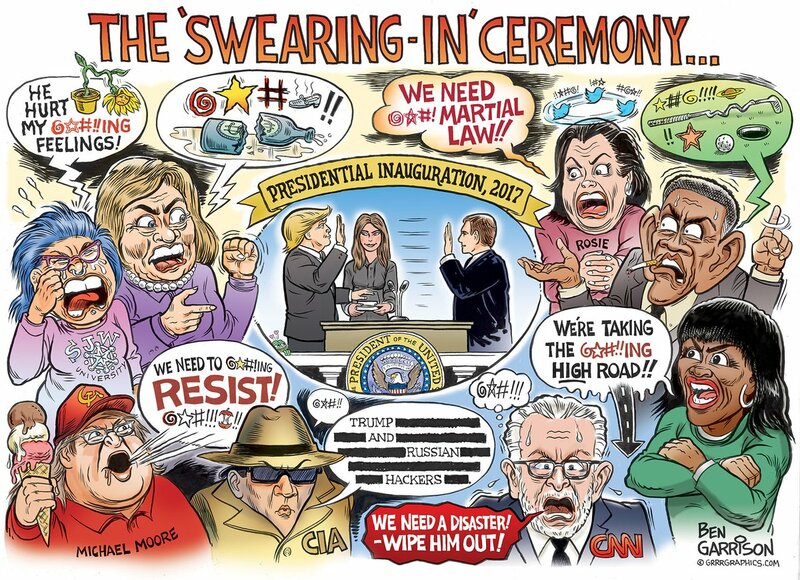 They are trying to demonize Nancy Pelosi while moaning about the potential for impeachment proceedings in a Democratic-controlled House. See the parallel? Let’s lay aside the obvious fact that this strategy failed for Hillary. It won’t work for Republicans either, for two simple reasons. First, no one really cares that much about old Nancy anymore. Her position as House Minority Leader is relatively low-profile and she hasn’t done much of note for a long time. And second, quite a few real Republicans despise Trump and would happily exchange him for Vice President Pence. They would get the same policies but more effectively managed and without that disgraceful lump in charge. The lessons of history seem equally obscure to Democrats. I am beginning to suspect that Trump is smarter than he seems. All those crazy tweets provoke his opposition into paroxysms of fear and hatred so that they focus all of their attention on denouncing him personally in apocalyptic terms. What little energy remains is used to attack the perceived consequences of his policies. The problem is that most of his policies actually achieve very little. So really, why should we fear them? Trump attacks immigrants, both legal and otherwise, and he killed the DACA program. This did have some effect and frightened the targets, but the impact so far is nowhere near what was feared. The federal courts have blocked the worst from happening. He blustered about a Great Wall on our southern border. So, where is it? His Republican-controlled Congress wants none of it. He thundered about disastrous international trade policies. Other than leaving the Trans-Pacific trade pact – probably temporarily, at that – what has he actually done? Not much that I can see. Even his vaunted tariffs are unraveling before they even take effect. He denounced our meddling in the Middle East as fruitless and wasteful, but really, what has substantially changed under his direction? Have we left Afghanistan, Syria and Iraq to their own evil devices? Not yet and probably not ever. But wait one minute! What about the myriad of executive orders and changes to administrative regulations by the Trump administration? Surely they have had a great impact, haven’t they? Well yes, they have, but even a biased observer must admit that some corrected excesses of an overly-enthusiastic Obama administration. And in any case, these are temporary changes. The next Democratic President can, and probably will, reverse all of these once again. So our economy will gyrate from one extreme to another until it falls exhausted and dizzy to the floor. And while Trump boasts about his Supreme Court appointment of the far right conservative, Neil Gorsuch, this doesn’t represent a change at all. After all, he is replacing Antonin Scalia, who was the most reliable conservative vote on the Court. Everyone has seen enough after more than a year to know that Trump hasn’t caused the end of the world as we know it. His tax plan is actually quite popular. Democratic attempts to vilify it as a massive giveaway to the rich have had little impact, regardless of the fact that they are perfectly correct. As I have often noted in my blog, envy is a much overrated target for political persuasion among Americans in general. They admire the rich and successful and mostly would just like to emulate them. Moreover, concern about looming deficits sits awkwardly on Democratic shoulders. Who believes that they really worry about them? They just think we are spending ourselves into bankruptcy for the wrong reasons. They have far better ones in mind if they get the chance next November. The bottom line is that both political parties misread the lessons of the past, squander the opportunities of the present, and plan ineffectively for the challenges of the future. Yet somehow, against all the odds, we survive and even prosper. 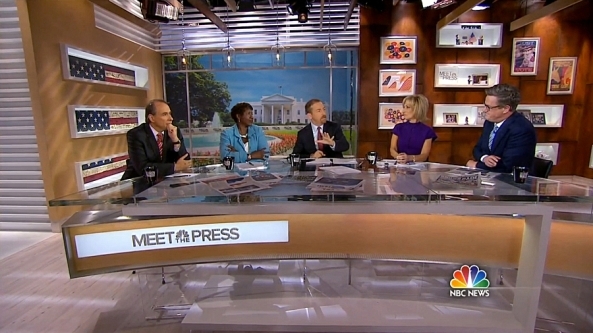 NBC’s Meet the Press characteristically provides a calm and informative look at politics that is a welcome respite from the raucous cheer-leading that contaminates most of our media. They recently took a look at the campaign announcement speeches of candidates for President in 2016, and found some interesting statistics. They broke down each speech into 13 topics and counted how much time was devoted to each one. Candidates prepare very carefully for these speeches. They have two goals foremost in mind. One is to emphasize the key issues for their campaign and the other is to repair any real or perceived deficiencies in their candidacy. It is reasonable to assume that the percentage of precious time devoted to a topic equates to its importance in meeting these goals. And perhaps this reveals a bit more than they would prefer. Let’s take a look at the Democratic candidates; perhaps I will cover the Republicans at a later time after they winnow down their multitude a bit. One consideration that preferentially affects Democrats is the need to speak to issues particularly important to the minorities who make up a large part of their voting coalition. The categories chosen don’t facilitate such analysis, but I think that the combination of Immigration, Education, Healthcare and Domestic Other may indicate the relevant emphasis, so I will lump them into Minority Interests in my discussion. I exclude Entitlement because I think this category is meant to capture its negative aspect, and this is in fact illustrated in the Republican speeches. 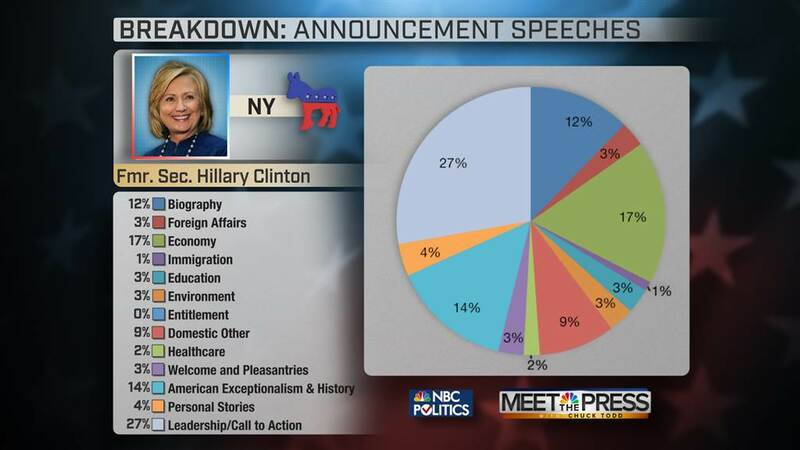 This is the breakdown for Hillary Clinton’s first big speech on June 13, 2015. She concentrated on four major areas. The Leadership/Call to Action topic is a favorite among all of the candidates. There is a consensus that leadership is currently lacking in Washington and all want to portray themselves as the remedy. One issue is dominant, the Economy. Her husband’s 1992 campaign said it best, “It’s the economy, stupid!” Notably, Foreign Affairs received short shrift. There is no doubt that this topic ranks high in voter’s minds, as we live in perilous times and the day’s news are filled with disturbing events. As a previous Secretary of State, she could be expected to speak knowledgeably about this and to flaunt her experience. Yet as we know, that is a dual-edged sword and association with the Obama administration’s foreign policy is not likely to help her candidacy. The merged topic area Minority Interests was significantly represented at 15% of her time. Finally, Hillary’s emphasis on American Exceptionalism & History probably is more to overcome a deficiency than to speak to a strength. Fairly or unfairly, all Democrats are tainted with the suspicion that they are not proud of their country or its history. As we enter the election cycle, Hillary holds a dominant lead, so the remaining candidates must justify their candidacies by distinguishing themselves from her. This no doubt adds another consideration in the choice of emphasis in their speeches. Sen. Bernie Sanders made his presidential candidacy announcement speech on April 30, 2015 and this is how he distributed his time. He concentrated far more than Hillary on the Economy, laying down his marker in this area. He said essentially nothing at all about Foreign Affairs and Immigration. Had he nothing to say or did he feel these topics are unimportant to his candidacy? Tellingly, he also said nothing on the topic of American Exceptionalism & History. If that signals his future campaign plan, it is a very risky approach. For Minority Interests, Sanders’ 13% reasonably met the standard set by Clinton but placed a far higher emphasis on Education. I think this is another area in which he looks to distinguish himself. Unusually in comparison to the other candidates, Bernie spoke relatively less about his Biography and Personal Stories. Perhaps he thought his long presence on the national scene made that unnecessary, or maybe he sees his early life and perspectives as an active socialist to be an area best left alone. Former Gov. Martin O’Malley’s announcement speech on May 30, 2015 breaks down as follows. He almost matched Sanders in his emphasis on the Economy and zero concern for Foreign Affairs. His allocation to Minority Affairs is 14%, and it breaks down very much like Sanders’ speech. Their principal difference is that O’Malley took on the nettlesome topic of American Exceptionalism & History with vigor and determination. Thus we see the two approaches among Democrats to this perceived problem, either hit it hard or completely ignore it. The topical breakdowns do not of course capture the difference in content between candidates’ plans, so O’Malley is certainly not a Sanders clone. However their overall areas of interest do seem to coincide, meaning that they will be battling for the same portion of the electorate. Former Gov. 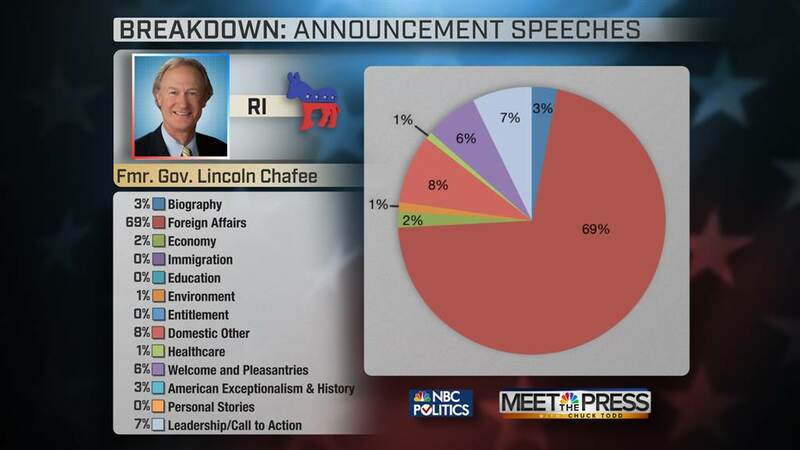 Lincoln Chafee made his presidential candidacy speech on June 3, 2015. Chafee broke the mold among Democratic candidates by devoting more the 2/3 of his speech to Foreign Affairs, while saying very little about the Economy and less about Minority Affairs than his competitors. It’s hard to see how his curriculum vitae would match this approach, but it certainly is different. Perhaps that explains why he devoted so little time to his Biography and Personal Stories. Looking at these data I am even more mystified at his candidacy than I was before. This doesn’t even seem like a plausible positioning for the second spot on the ticket. The Meet The Press analysis did not include Former Sen. Jim Webb who announced his candidacy on June 3, 2015, primarily through a lengthy blog post. My cursory search for a formal announcement speech came up dry so perhaps there is yet to be one. However his omission here is due to the fact that the Meet The Press article was published before Webb’s formal entry into the race.